This breakthrough book explains how enjoying a diet of life force foods--foods that keep you at the pinnacle of health--will ensure you have a healthy, slim, energetic body and retain the vibrancy of youth. The Life Force Diet will help restore you to your ideal body weight and even prevent or reverse illnesses like diabetes, heart disease, and cancer. What is the secret? The Life Force Diet demonstrates that certain foods are more than a means of satisfying hunger or cravings--they're our secret weapon against aging, excess weight, and disease. And what do life force foods contain? Enzymes! Enzymes affect every single life function, including thousands of essential biochemical reactions in the body. If we are deficient in dietary enzymes, our bodies have to expend energy making their own. Scientists have proven that the more enzyme-depleted foods we eat, the faster we lose our internal supplies, the result of which is exhaustion, weight gain, accelerated aging, and the onset of illness. But there's good news. By eating a diet high in enzyme-rich life force foods, we can reverse these problems and turn back the clock on aging. Life force foods are the key to weight loss, mental clarity, boundless energy, and radiant good looks. In just three weeks you'll feel a renewed sense of vitality, and marvel at clearer, smoother skin, and more lustrous hair. 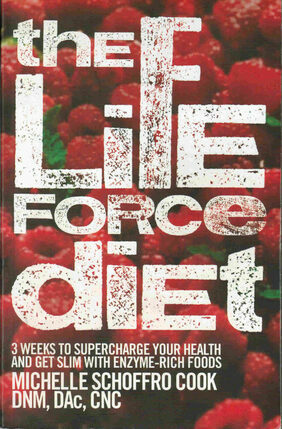 What's more, you'll find that The Life Force Diet has such delicious recipes, you'll look forward to every meal! In this 282 page e-book Dr. Cook coaches you to transform even the poorest of diets. This e-book is available as a .pdf file which you can immediately download after purchasing the e-book. Pdf files work on most computers. You will be sent a link to this e-book which you click to download. This link is available for 72 hours after purchase so be sure to download your e-book as soon as possible.